GUATEMALA CITY (NYTIMES) - Rescue workers searched for survivors Monday (June 4) amid a desolate landscape of ash and mud after a volcano erupted near the Guatemalan capital the previous day, killing at least 65 people. 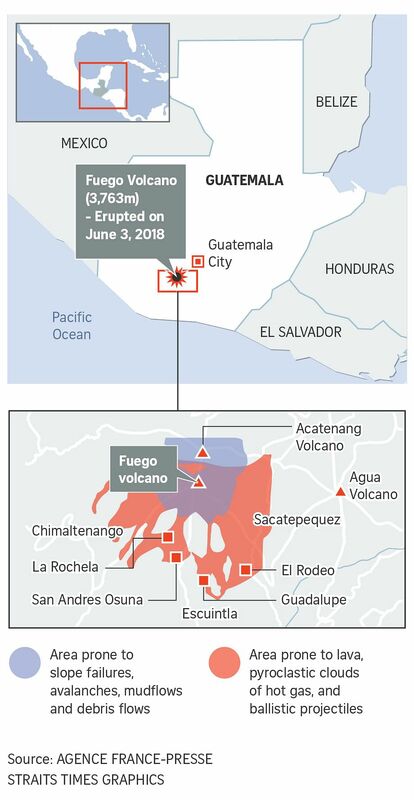 The number of missing after Volcán del Fuego's eruption was unclear, said authorities from Guatemala's natural disaster commission, known as Conred. The volcano, which sits less than 30 miles from the capital, Guatemala City, erupted just before noon Sunday and continued to spew ash, rocks and gas into the air. A second powerful eruption followed at 6:45pm. By Monday, the intense activity had subsided, Conred said. The volcano, whose name means "fire," had returned to its normal state of activity. Some 2 million people were affected by the volcano's ash, which billowed 15,000 feet into the air and dispersed over a 9-mile radius. More than 3,200 people were evacuated and at least 46 people were injured, some of them with severe burns. More than 1,600 were in shelters. Earlier, Reuters reported that the capital's airport was closed because of the danger that ash posed to aircraft, citing Guatemala's Civil Aviation Authority. Sergio Cabañas, a Guatemalan disaster official, said Sunday that officials would work as long as it took to evacuate people from around the volcano. Volcán de Fuego is one of many volcanoes that are active in Central America. Janine Krippner, a volcanologist in West Virginia, noted on Twitter that the Guatemala eruption was unlike the continuing lava flows at Hawaii's Kilauea volcano because it was spewing what scientists call "pyroclastic flows" - quickly moving avalanches that can be "devastating and deadly." The US Geological Survey defines a pyroclastic flow as a "chaotic mixture of rock fragments, gas and ash" that can reach temperatures of several hundred degrees Celsius and travel at a speed of tens of meters per second. It says the combination of speed and high temperature makes such flows particularly dangerous and deadly.